You may have heard of CoolSculpt or Fat Freezing, but now it’s time to turn up the heat with Sculpsure®. Aydin Plastic Surgery is proud to be one of the first facilities in Bergen County to bring the science of SculpSure® to its patients. SculpSure is the world’s first FDA-cleared laser treatment for non-invasive lipolysis of the flanks and abdomen. Sculpsure is a controlled light-based technology, ideal for patients looking to get rid of stubborn fat. This newly FDA approved technology has been featured on Dr. Oz, Shape Magazine, New Beauty, and E! News. SculpSure® ‘s breakthrough patented technology uses a laser that precisely targets fat cells under the skin. This means you can burn get rid of that stubborn fat, with out going under the knife. SculpSure efficiently treats areas of troublesome fat in just 25 minutes. Over time, the body naturally eliminates the disrupted fat cells with results seen as quickly as 6 weeks. 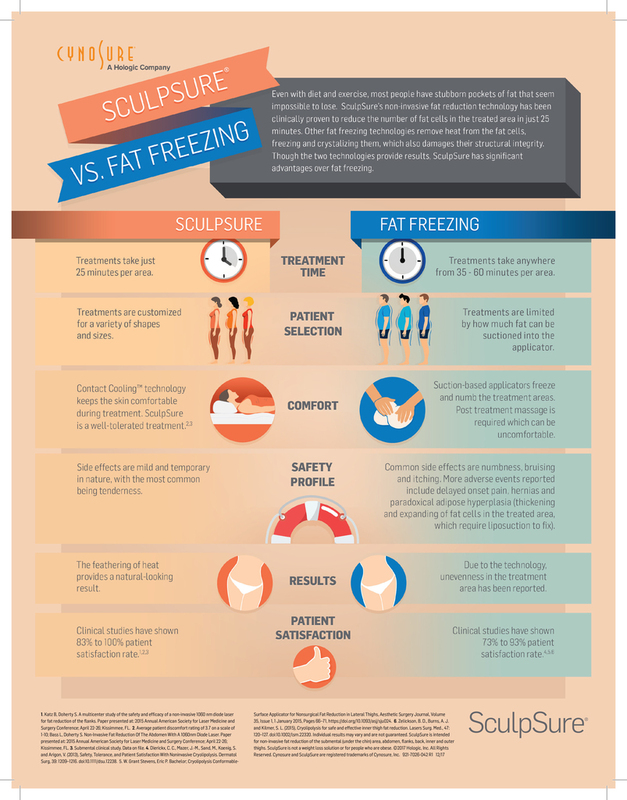 Here’s a quick look at the differences between SculpSure and Fat Freezing.